Webster defines contentment as "the state of being contented: satisfaction…not desiring more than one has: satisfied; resigned to circumstances, assenting, satisfied with things as they are." In the Bible content is from two words. The first word, ARKEO; means "to be possessed of unfailing strength, to be strong, to suffice, to be enough; passively to be satisfied with a thing, contented." The second, AUTARKEIA describes "a perfect condition of life in which no aid or support is needed; hence, sufficiency of the necessities of life: contentment." Gratification. Paul did not always have all he needed. Sometimes he even went hungry (Philippians 4:11). However, he was always content (v. 12). Thus, gratification does not guarantee contentment and one may be content though lacking necessities and comforts. How often have we seen someone who thought they could be happy if they could just have, or do, or be…only to experience disappointment, once gratified. Contentment is not rooted in possessing or pleasure. Lack of Ambition. There is nothing wrong with wanting to succeed, improve, or do better. As a matter of fact, God's word teaches us to be thrifty and diligent in the management of our resources in order to increase our substance (Proverbs 10:4). God encourages us to work hard, achieve and rejoice in our success (Ecclesiastes 2:24; Proverbs 10:5; Ephesians 4:28). What God disapproves is a covetous spirit and an insatiable desire for more and more (Ecclesiastes 5:10-11; Proverbs 1:19). The real joy in work, success and possessions is the realization that one has enough and the joy that comes from giving to other (Ephesians 4:28, 29; Proverbs 30:8-9; Acts 20:35). Indifference. Laziness is a sin, and neglect is a greater sin (Proverbs 24:30-34). The man who will not work is unworthy of support (II Thessalonians 3:10). Too many try to ennoble their disorderly conduct by calling it contentment (Proverbs 21:24-25). Submission. In order to be content one MUST be realistic (Matthew 6:25-34; Ecclesiastes 1:15). The short man is not going to be tall, nor the bald man grow hair. There are some things we cannot change, but change the things you can and use the things you cannot (Luke 19:4). As one fellow observed they're not stumbling-blocks or barricades, but stepping stones. Pleasure. The secret to finding contentment is learning to enjoy the things you have, rather than finding displeasure in what you do not (Hebrews 13:5). This wrong perspective leads to jealousy and envy (Ecclesiastes 4:4; Proverbs 14:30). Life is robbed of its joy when we waste it pining away for what we do not possess while never savoring the what is ours and ours alone. Satisfaction. Paul wrote the Philippians and said, "I am full" (4:18). 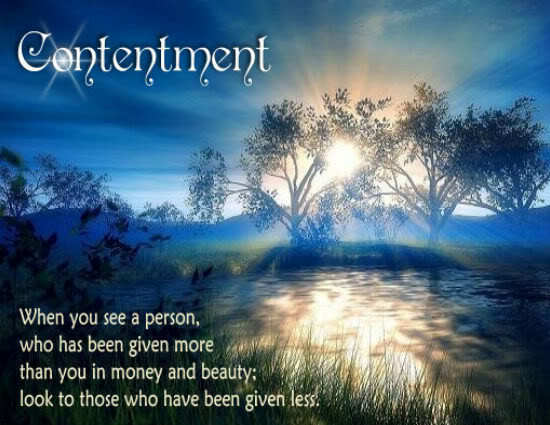 Contentment comes when one is able to recognize "It is enough." The wise man says there are four things that are never satisfied: the grave, a barren womb, the earth which drinks in the rain and fire (Proverbs 30:14-16). He describes the men of his day as horse leaches that cry continually, "Give! Give!" (cf. Amos 4:1). There is a point when we have enough (I Timothy 6:8-10). The Apostle Paul said, "I have learned, in whatsoever state I am, therewith to be content" (Philippians 4:11). It is obvious then that we do not just wake up one morning and realize we are content. 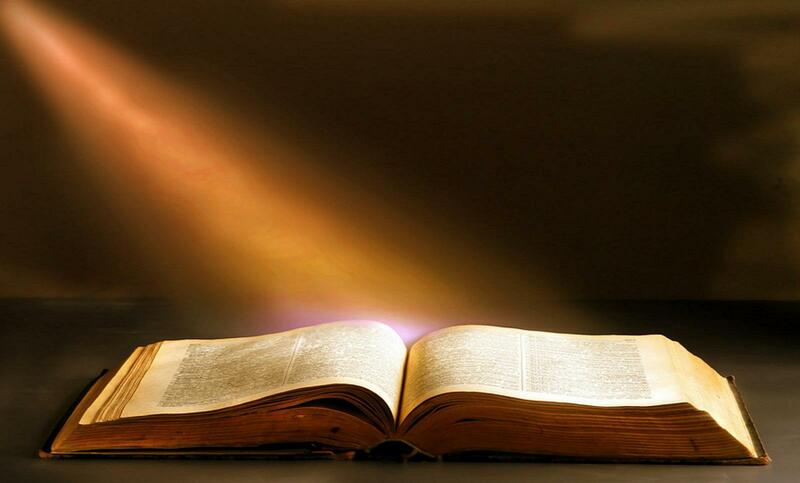 It is a state of mind that we must acquire through the discipline of the word of God. It is something that comes through the faithful practice of the religion of Jesus Christ (I Timothy 6:6). We may learn to be content by following the example of Christ. Jesus did not possess a lot of things (Matthew 8:20), but surely He was one of the happiest men that ever lived. He understood that life is not measured by the size of one's bank account (Luke 12:15; Matthew 6:19-21, 25). He learned to trust in the Providence of God and the goodness of His brethren (Luke 6:27-38; Matthew 6:33). He was a giver not a taker (Acts 20:35). We can learn contentment from the discipline of suffering. We can be perfected through suffering even Jesus was perfected (Hebrews 2:11). Trials build character which is of greater worth than things (1 Peter 1:5-7). Through suffering we develop greater faith and inner strength (Philippians 4:11-13; Romans 5:3-5). The experiences of life will teach us how to be content if we will let them. The average or common lifestyle produces the heartiest people and those most likely to be truly reliant upon God (Proverbs 30:8, 9; cf. Hebrews 13:5; Matthew 6:24). Abundance tends toward dependence upon what one possesses (Ecclesiastes 4:6). Poverty often seduces to despair and cynicism (I Timothy 6:6-10). But a life filled with hard work and a thrifty lifestyle brings one to know that God is good and takes care of the righteous (Ecclesiastes 5:12; Proverbs 11:28; 22:4; 1 Peter 3:12). It is important that men learn it is what you are and do that endures, rather than what you had and spent (Proverbs 23:5; Ecclesiastes 2:18-19). We can learn to be content from the examples that are about us. I remember hearing my mother say of the life during the Depression, "We were all poor we just didn't know it." What they lacked in material things they made up for in love and affection. The simple life can be a wonderful life if there is love in the home, whereas we can have both fists full and be miserable because we are consumed with things rather than relationships (Proverbs 16:8; Proverbs 17:1). Strength of character is what gives enjoyment to one's possessions. Jesus knew it was not having that brought joy but doing (Acts 20:35). When we put our faith and trust in God rather than things (Hebrews 13:5) and get our priorities in order (Matthew 6:33) putting our substance under His authority (Proverbs 22:7; 11:16; 12:11; 21:17), then we will be on the road to contentment.